Does anyone else get the urge to cook and/or bake around the holidays? So if you follow me on Instagram, you’ve noticed that I’ve been cooking lots of things. Immediately after my last final last week, I went out to dinner….4 nights in a row. If you live in NYC, it adds up pretty quickly. Throughout the semester, I relied on my boyfriend to make dinner most nights (with help from Blue Apron) and/or take out and/or lots of snacks. Forget about even making lunch and bringing it to work or making food for class after work. Prior to school, starting I probably cooked more often but still not that often to call myself a cook or someone who likes to do meal prep. Since I have an abundant amount of time lately (not really), dwindling funds, and a boyfriend who’s been away for the past week, I cooked/baked every night since last Saturday. I was trying to be healthy and then it went down hill as the week progressed. I was experimenting with quick and easy recipes to see what would maybe work for next semester when I’m crunched for time. 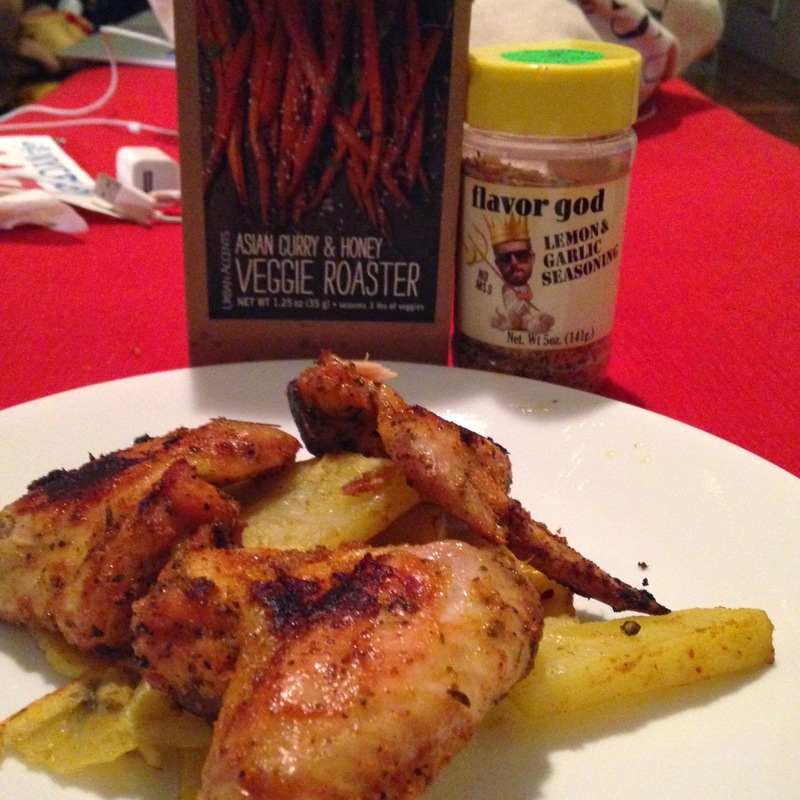 Last Saturday night, I made baked chicken and potatoes with the above spices. Flavor God is delicious and was a gift from nutrition coach, Liz Barnet. I did her 6-week nutrition program last summer. Flavor God is low-sodium, paleo and all that good stuff. I used it on the chicken. The Asian Curry and Honey roaster spices were used on the potatoes. They were probably better off on carrots or beans but still good. I had plenty of leftovers for Sunday night and for Monday’s lunch. Both were in the oven at 350 degrees for about 35-40 minutes. 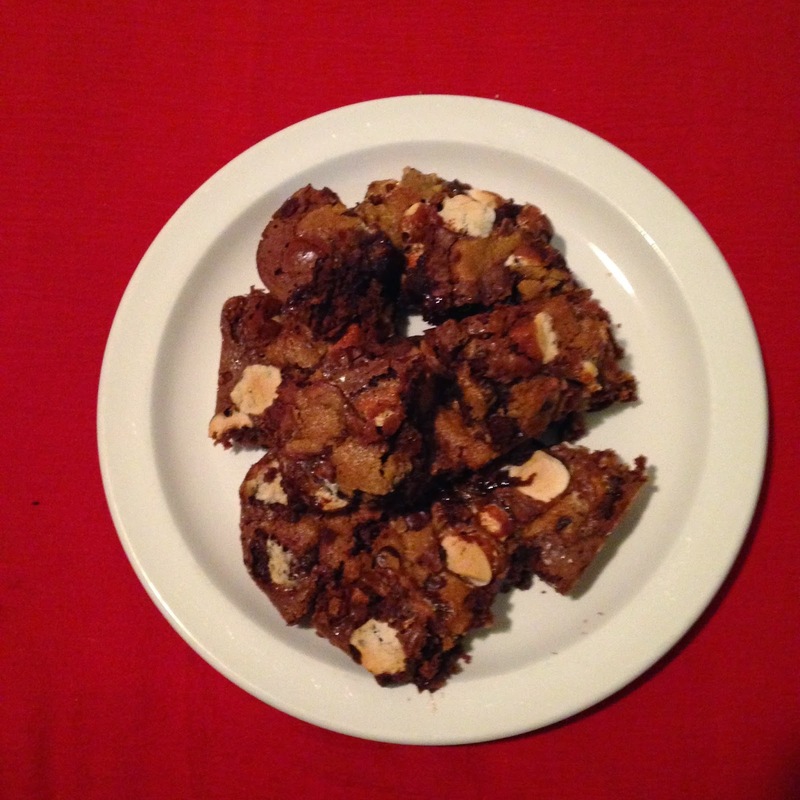 I also experimented with brownie bars – both were boxed mixes. I definitely should have cooked them longer but they were still really good. 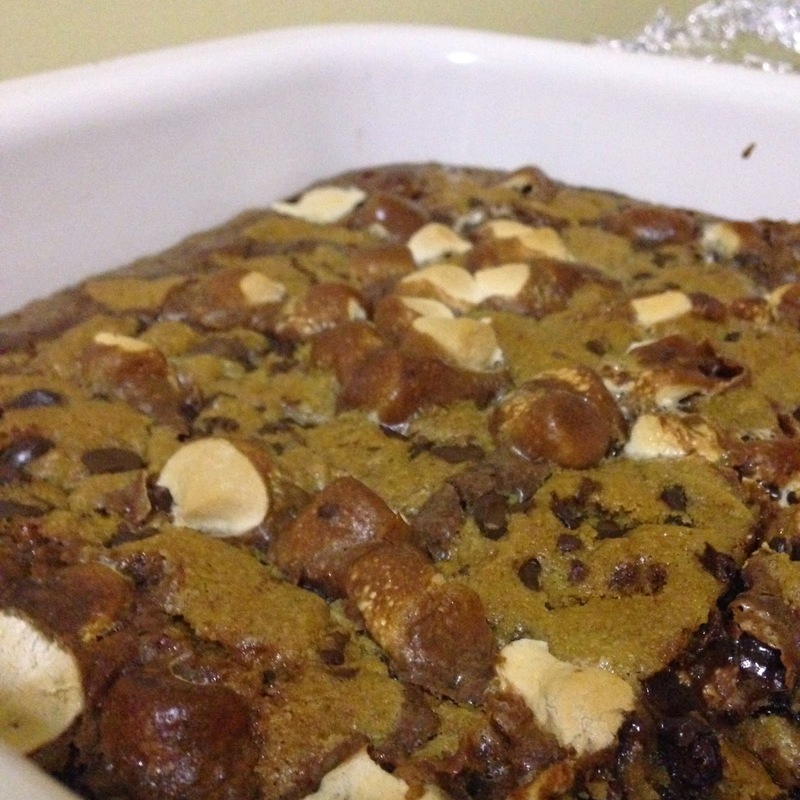 I added Whole Foods marshmallows to the mix. Monday night – I was hyped to make food even thought I took two classes after work (SLT w/ Liz and tried out BFX Studios’ spin class). My goal was to make salmon but tilapia is so much cheaper so I got 1.7 lbs of it (which comes out to 4 large fillets). I used Flavor God’s lemon & garlic spices, salt and pepper for the tilapia and baked it for 20 minutes at 350 degrees. I wish I pan roasted it or fried it or put it in tacos. It’s a really thin fish that would be delicious as fish tacos. 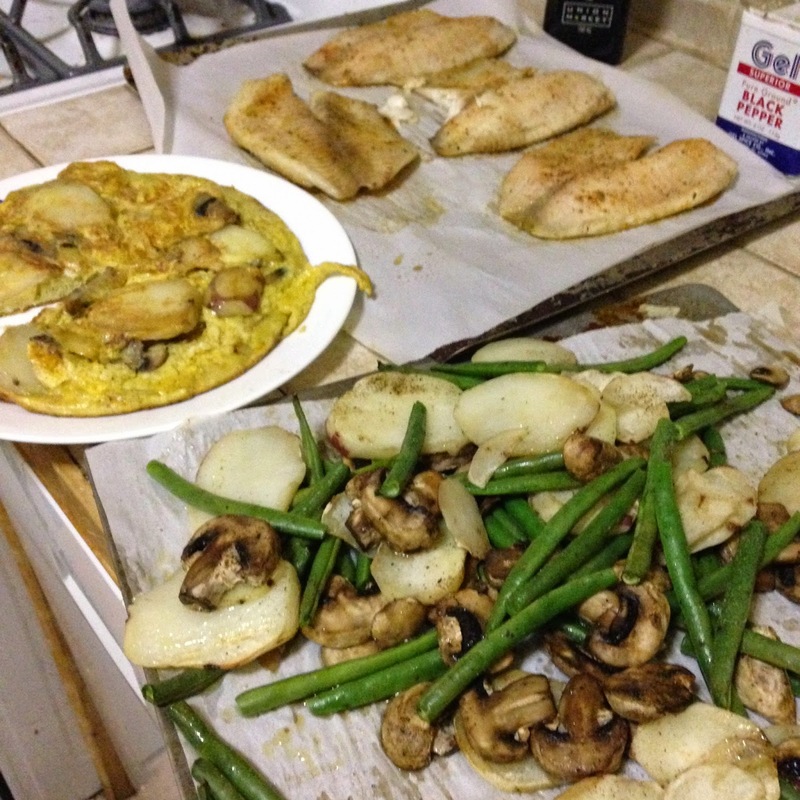 Monday night I also made veggies and potatoes to go with the tilapia and a frittata/spanish omelet of sorts. The frittata is just an easy recipe that I’ve used from time to time because you can get 4-6 portions out of it. This time instead of just using potatoes, onions and eggs, I also used mushrooms. This was the first time I ever used or bought mushrooms to use on my own (outside of blue apron meals) and it was perfect in the frittata. I threw in the potatoes (used one potato thinly sliced) on medium heat in a skillet and threw in the onions and mushrooms after. I scrambled about 7 eggs, threw the skillet in the eggs then dumped in back in the skillet and covered it. It makes a lot of food especially if you’re short on time or hate sandwiches (like me). Both recipes made Monday night, was enough for dinner that night, and 2 additional lunches and 2 more dinners. I actually still have tilapia leftover. 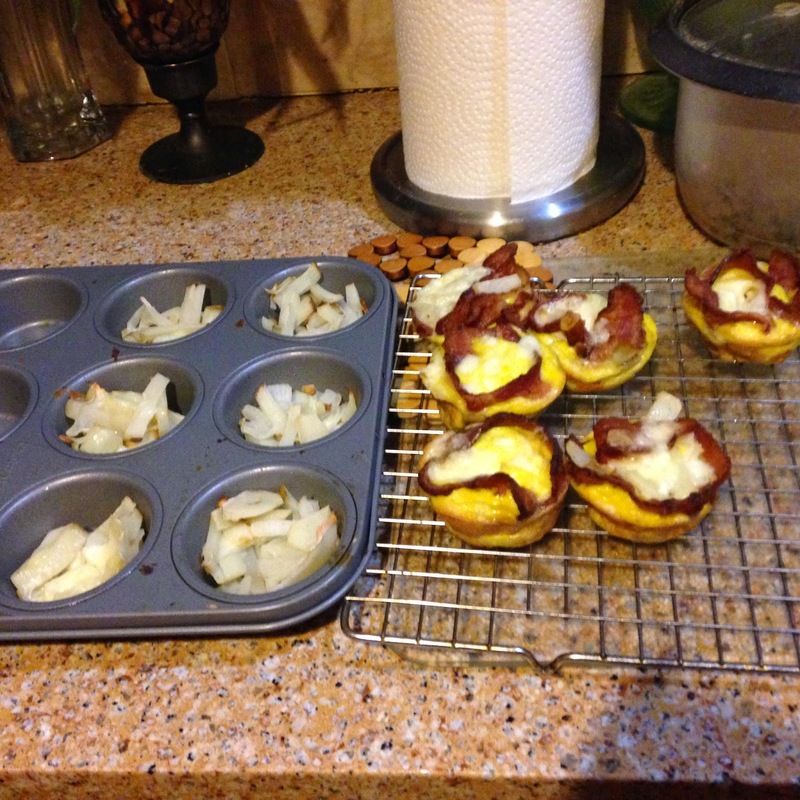 After 10pm mass Christmas Eve, I was hungry and hyped up so I made these egg muffins. My mother bought so much food (including packages of bacon and italian sausage). In the 36 hours I was home upstate at my parent’s, I made 2 batches of egg muffins, a (failed) brownie attempt, stuffed peppers, and a pasta dish. 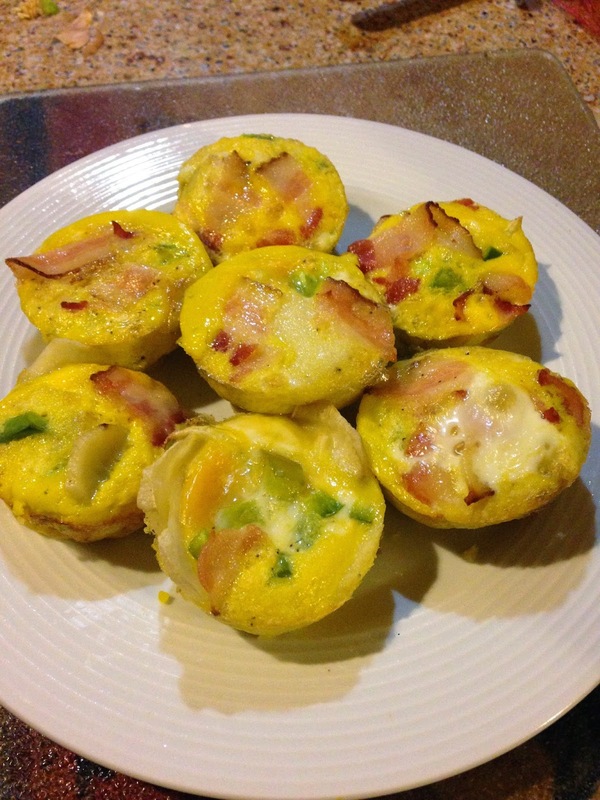 The egg muffins were so simple to make and definitely something that I’ll be doing more of. Plus because they are baked they 1) puff up 2) aren’t dried out like skillet frittatas (or at least mine). I filled each of the cupcake holders to the top and these puffed up out of them when cooked. For both recipes, I sautéed and drained the peppers, onions, and bacon and threw in cut up potatoes that weren’t cooked. Since the potatoes are the densest, then were on the bottom and cooked completely through. I had both batches at 350 degrees for 15-20 minutes. 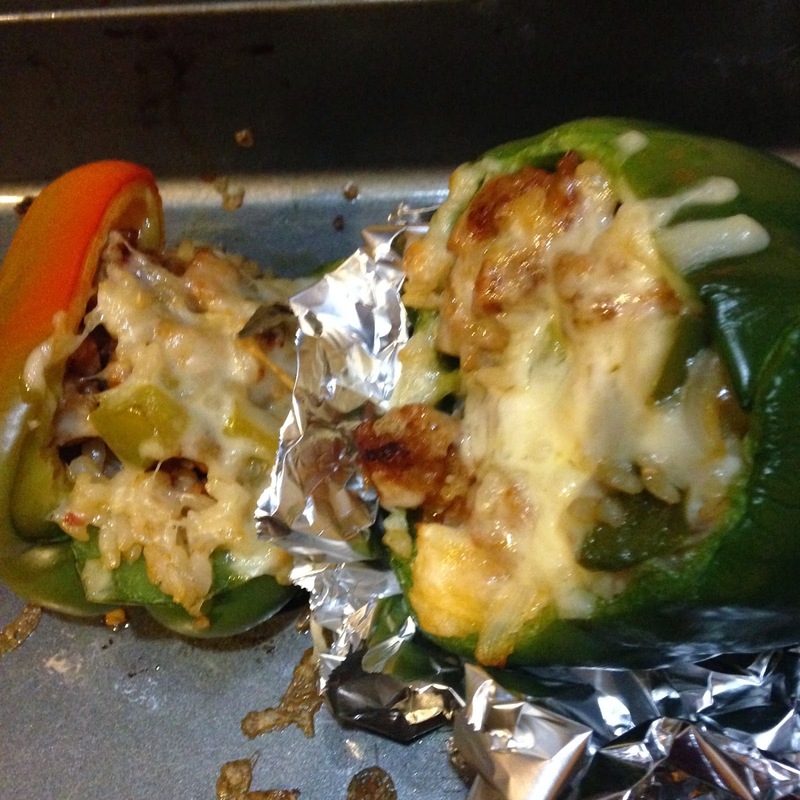 Because there was leftover brown rice, peppers and italian sausage, I made a quick and easy stuffed pepper recipe. I didn’t have beans but that was fine. 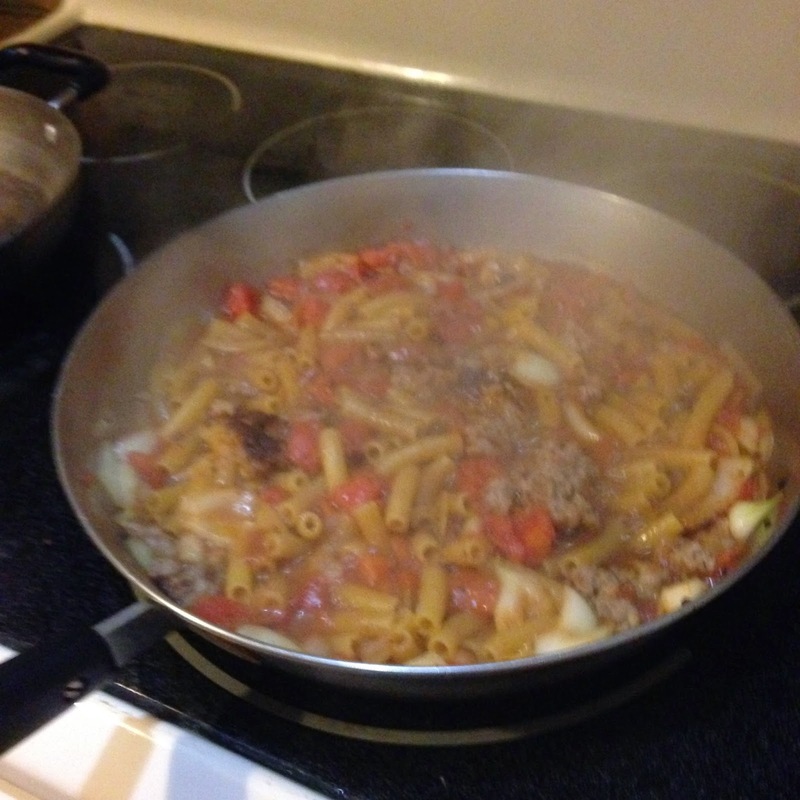 I took the italian sausage out of it casing and sautéed it with chopped onions and peppers. 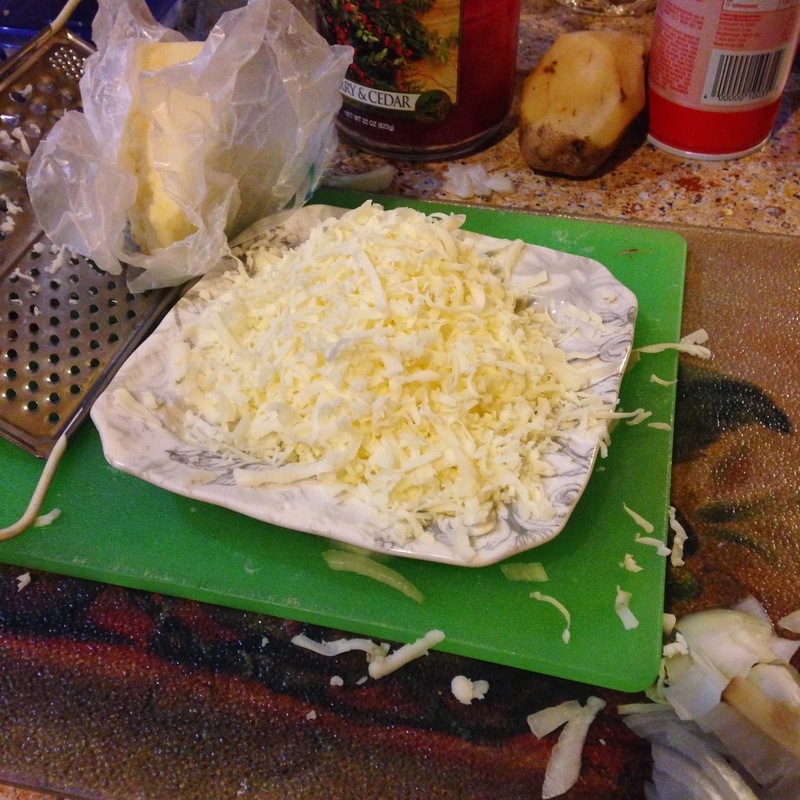 Once it was cooked, I threw in the rice into the skillet and added some pepper and a bit of salt and stuffed the peppers and topped with monterey jack cheese. Because I only had two peppers, I only had it in the oven for about 15-20 minutes. A lot of other recipes call for 45 minutes but those are much bigger servings. After I made the peppers, I made another batch of egg muffins. With this batch, I didn’t bother to cut up the bacon and I ran out of eggs so I made potato hash and threw on some monterey jack cheese on top of both hash and egg muffins. 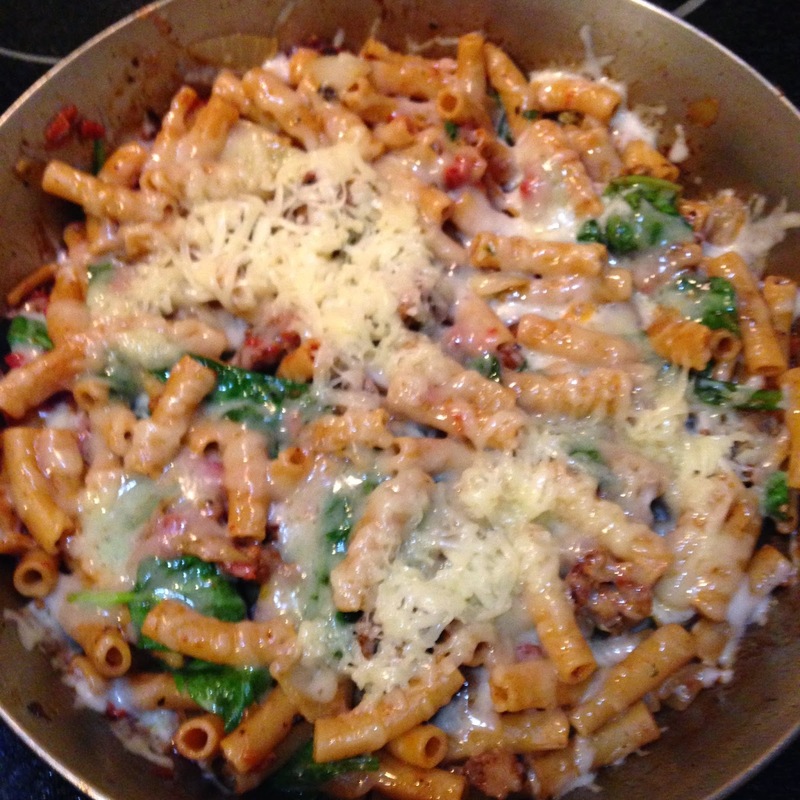 So around dinner time on Christmas Day, I decided to make this pasta dish that I found on Pinterest. The recipe was from Budget Bytes. Instead of using canned tomatoes with chiles, I just used regular tomatoes and instead of using just some cut up sausage, I used italian sausage removed from the casing so it look like large chunks of ground beef. The best thing about this dish is that it’s a one pan dish. The uncooked pasta is thrown in after the sautéed sausage, onions and tomatoes with chicken broth so the pasta cooks using the chicken broth. If I made this for myself, it would at least provide a whole week’s worth of lunch but it went pretty fast since the rest of my family had some. I really wanted to make latkes this morning since there were so many potatoes leftover (and lox!) and I had been craving them but I didn’t wake up in time to make them. I’m looking for more recipes – preferably things that I can get various meals out of. Any suggestions? What’s your go-to meal prep meal? Does anyone not cook like me?